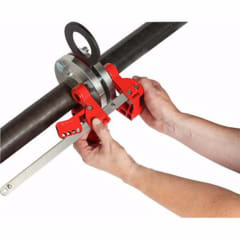 Brady Corporation offers a new pipe blind lockout solution that can be applied to the widest range of pipes. By easily and temporarily locking pipe blinds in place, companies can improve safety by preventing the release of gas, steam and hazardous liquids while pipe maintenance is ongoing. The Pipe Blind Lockout can provide a very visual, physical barrier that acts as a deterrent for touching pipe blinds while maintenance is ongoing. When used with a properly installed pipe blind, the lockout device and a padlock reduces the risk of accidental release of pipe contents. This enables companies to increase workplace safety and also improve compliance with EU Guidelines 89/655 and the European Norm 1037. The Pipe Blind Lockout has been UL tested for ISO 80079-36:2016 Explosive Atmospheres and falls within the parameters of the norm. The device is built out of a heavy duty 304 stainless steel with rugged, cast aluminium locking bars and a powder coated polyester finish. With 3 sizes to choose from, Brady's Pipe Blind Lockout is applicable on the widest range of pipes, including all pipe diameters from 13.2 mm to 1219.2 mm. The device's extendable locking arm enables users to optionally lock not 1, but 2 pipe bolt sets for additional security. Up to 4 workers can apply a padlock directly on the device. Get the free Lockout/Tagout guide book via the Brady website.